Our school (Ecole Interculturelle de Français) is for foreigners wishing to learn French. Avenue Franklin Roosevelt in Lyon (France). You can learn French in Paris. But you can also take French courses in Lyon, the second biggest French city. It is located in the heart of the UNESCO world heritage site. 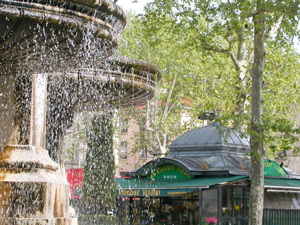 The city is also known as the capital of French gastronomy and the birthplace of the cinema. It is close to Geneva (Switzerland), but also to ski resorts of the Alps (Mont Blanc). The school teaches French language (grammar, vocabulary, phonetics, civilisation...) and its culture. Teaching is based on a lively practise of French within the classroom. "Workshops" enable students to take part in the life of the city, in order to improve integration and to practise French outside the classroom. The school also prepares students for the Delf and Dalf exams (national diplomas of the French Education Ministry).